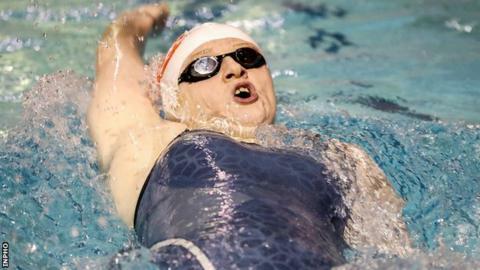 Larne swimmer Danielle Hill and Lisburn's Daniel Wiffen chalked up wins on day four of the Irish Open Championships. Hill added to her 50m backstroke gold with victory in the 100m event in a time of 1:02.09. Wiffen continued his impressive form, doubling up on his 800m freestyle title from Friday in the 1500m event and clocking 15:53.03. Shane Ryan and Brendan Hyland set new Irish records in Dublin. A blistering swim (53.85) from Ryan saw him take two tenths of a second off his previous best in the 100m backstroke to claim a second title this week. Hyland clocked 2:01.52 for gold ahead of Bangor's Jack McMillan (2:02.98) and National Centre Limerick's Cillian Melly (2:03.84). Breaststroke aces Darragh Greene and Niamh Coyne completed national title hat-tricks across the 50m, 100m and 200m events. Greene added a championship record of 27.50 in the 50m event to a 200m Irish and championship record while Coyne touched in 31.91 in the 50m for her third title. Wiffen, who set a new Irish junior record in the 800m event, touched in 15:53.03 to dip under the consideration times for European and World Juniors once again. British Olympian Hannah Miley collected her fourth commemorative gold of the meet in the 200m freestyle final. Miley held off Bangor's Rachel Bethel touching in 2:02.44 while Bethel collected her second national title in 2:03.45, adding to a 400m freestyle title from Wednesday.